West Sussex bordering with East Sussex (with Brighton and Hove), Hampshire and Surrey have a lot to offer families who want a holiday destination that provides some good beaches and plenty to do on and off the beach. The coastal area of West Sussex is also known for its dryness as the beaches are protected by the hills of the South Downs. You don’t have many golden sandy beaches, most typically change depending on the tide with pebbles at high tide and then as the tide gets lower sand becomes available. A few sand dune systems exist like the one at Climping Beach which is just to the West of Littlehampton where along with a great beach you also have a nature reserve within the dune system. As well as the typical family beaches a number provide good watersports with kite based sports being popular. 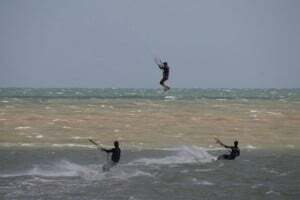 As well as kite surfing the large areas of compact flat sand at low tide provide good kite buggy locations. If you want a break from the beach why not explore one of the many pretty towns (Chichester, Arundel, …), castles and old houses (Arundel, Petworth, …), museums, or just go walking and enjoy the views from the South Downs. West Sussex is a great place to stay and explore one of the lesser visited areas of the UK.